I will never view Delilah from the Bible in the same way again. Wow. It was so easy to dislike Delilah while I viewed her as just an evil woman in the pages of the Bible. Granted, this is a fiction account so we don’t really know what she was like, but the author made her human for me. It was a riveting read. Was Delilah actually a wounded woman as the story portrayed? I don’t know, but I would like to think that she was. Horrible life experiences can shape people in ways that cause them to act out negatively. I cannot judge her. I don’t know what may have shaped her. But this story did give me some insight on what may have made her the woman we know of from the Bible. My heart ached for her. This book is not only written from Delilah’s perspective, but Samson’s as well. While I wasn’t a big fan of Samson, I found myself wishing that the story would end differently for him. And yet, I felt that his death was the most powerful point of the book. The way that the author wrote of his death and the interaction between him and Delilah took my breath away. I saw God’s character so clearly reflected in that moment – it made me get choked up. The outstanding job that the author does in making Delilah, not just another characters in the pages of a book, but a woman who should draw out compassion in us. The light that it shed on my preconceived notions of Delilah. Would I recommend this book to others? Absolutely. 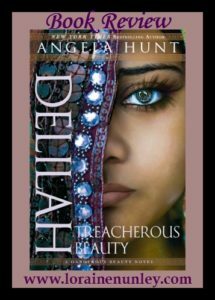 I loved how the author made Delilah a real person to me and how God was so beautifully reflected. I also enjoyed the author’s research notes which were very interesting.